In our previous articles we defined some of the terms you’ll hear in the batting world. Just as there are many choices when it comes to the fiber type you can choose for your thread, quilt batting comes in a variety of different fibers. Heck, you can even find Alpaca batting! For this article we are going to talk about the most common types of batting and why you might choose one type over another. 100% Cotton:(bleached or unbleached): The longest fibers of the cotton plant are used to make clothing and home decorating fabric. The shorter left over fibers are made into cotton batting. Cotton batting is made from a renewable resource and is biodegradable. The cotton can be scoured and bleached. Cotton/Polyester Blend: these battings have become very popular in the quilting industry as the cotton provides a bit of shrinkage when washed to introduce a bit of that vintage look while the polyester lifts up into the quilting lines to give them definition. You can also purchase cotton/poly blend battings in black which is a great choice for those quilts that have a dark backing fabric. Using a black batting will help reduce the tufts of light colored batting that may be brought through to the back of the quilt with the needle of the machine. This is our favorite type of batting at Quilted Joy! 100% Polyester: Perfect for those times when you want to minimize the shrinkage, keep your quilt very lightweight but still have a bit of loft all with a nice drape. Most poly batts are bonded in order to reduce bearding. Caution: Poor quality poly batting have fibers with rough edges which can cause significant increase in thread breakage. Also, polyester fibers are made from petroleum which is a non renewable energy resource. The manufacturing of polyester battings requires a great deal of chemical processes and waste products. The Pay Day Quilt has a layer of Hobbs Wool and a second layer of Hobbs 80/20. Wool: This batting has almost magical properties and is increasingly popular. It is naturally resilient and resists wrinkles making it a perfect choice to use on quilts that will be folded and stored or shipped for any length of time. It has a natural kink to the fiber which gives it loft. Plus, the air that gets trapped in the fibers of wool wick away excess heat and moisture while at the same time it provides insulation to the body’s warmth. The down side is that wool can be guilty of migration and bearding unless it has some kind of interfacing or stabilizing scrim applied to it. An alternative to a wool batting with scrim is to use two battings, most commonly a cotton/poly blend, with the wool batting on top so the blended batting can act as a gate or fence keeping bearding and migration to a minimum. It can also be fairly expensive. Silk: Typically silk batting is blended with another fiber. Many times that fiber is polyester. It is popular as an alternative to Wool battings as it also breathes well and washes up great. It is very lightweight and also fluffy. Very popular in quilted garments. Bamboo: Because the plant grows so quickly and replenishes itself when cut, it is becoming more popular. This is a newer fiber to our culture and there may be many, like me, who don’t know they are allergic to it until they open the first package of bamboo batting they encounter. I have found that while it quilts up beautifully, it can be very linty and I’m simply too allergic to it to allow in my studio. Recycled: This batting is made from plastic bottles that have been shredded and spun into fibers. This batting is very similar in feel to polyester batting. It can be washed and dried with very little shrinkage. Fire Retardant: Just as children’s pajamas and bedding may have fire retardant properties, you can also find batting which is especially made for use in kiddo quilts. Some states have laws governing the types of materials that can be sold for children. If you are making children’s quilts for sale, you may consider using this specialty batting. Fusible battings: These are not ideal for a stand up quilting machines but are perfect for sit down quilting machines. After sandwiching the quilt layers together you’ll hit the quilt with an iron to fuse the layers together eliminating the need for basting or pinning. 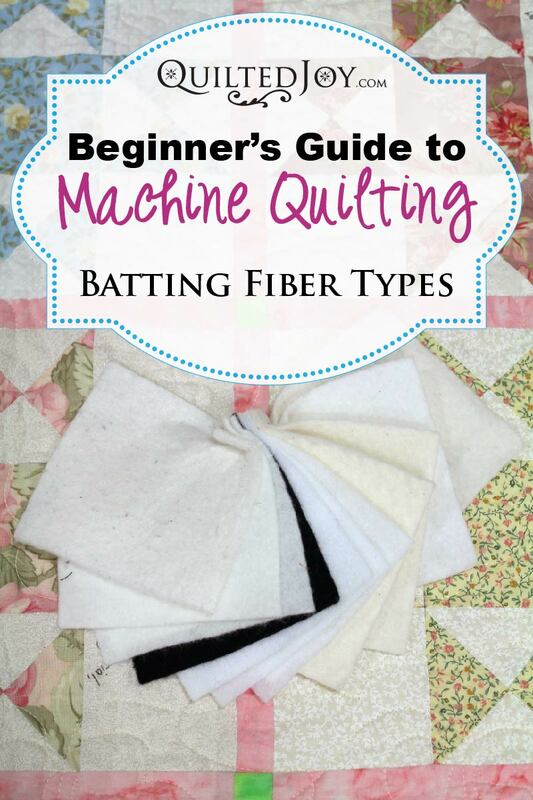 This article is part of the Beginner’s Guide to Machine Quilting series. Click here for more articles in the series. Previous post: Busy Busy Renters! Next post: Thank you, Judi!